2009 January Quite a large UK price reduction – perhaps signifying imminent ‘end of life’ for the 400D as the 500D comes in? 2008 May 14th The US rebates are listed on the 5D2 page – no 450D rebate, but plenty of lens ones. 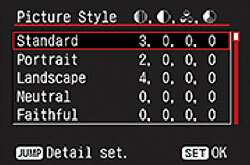 An EOS1000D/ Rebel XS is mentioned inside the latest release of DPP – a new introductory level camera? Note that on the page it says it is only for purchases up to the end of June. March 8th 2007 The ’20th Anniversary’ kits and offers in the scanned PDF I mentioned on the main Canon News page the other day are now appearing. I had a report of them on the Warehouse Express web site here in the UK. 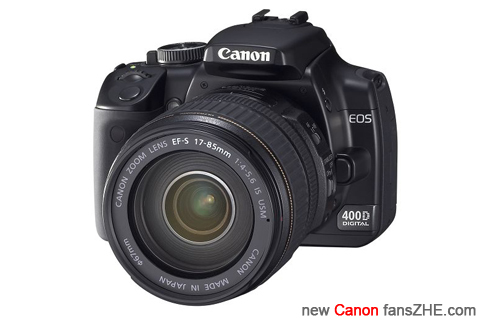 Canon Netherlands PRAmstelveen, The Netherlands, 24 August 2006:Canon today announces its next generation D-SLR: the EOS 400D. Featuring a 10.1 Megapixel CMOS sensor, new EOS Integrated Cleaning System, larger and brighter 2.5” LCD and 9-point AF, the model is predicted to take the lead as the world’s most popular camera. It is positioned above the EOS 350D, currently the fastest selling SLR camera of all time.Canon’s EOS 300D, the world’s first consumer D-SLR, kick started a digital revolution in 2003. “We are now witnessing a mass consumer trend towards D-SLR,” said Mogens Jensen, Head of Canon Consumer Imaging Europe. Reduce – Internal camera mechanisms are designed to minimise dust generation. The body cap is redesigned to prevent dust generation through wear on the cap itself. Repel – Anti-static technologies are applied to the low-pass filter covering the front of the sensor so as not to attract dust. Remove – A Self-Cleaning Sensor Unit uses hi-frequency vibrations to shake dust from the low pass filter for a period of approximately one second after each start up. For instant shooting after power up, this feature is disabled immediately the shutter release is depressed. The EOS 400D also incorporates the same DIGIC II processor found across the EOS range right through to EOS-1 professional models (see Appendix ‘Technologies Explained’). As well as providing superior image quality through advanced rendering algorithms and almost instant 0.2 second start up time, DIGIC II’s accelerated processing prioritises the photographer’s ability to keep shooting by clearing the buffer quickly between frame bursts. Canon Australia PRA 10.1 megapixel CMOS sensor, simpler operation and Canon’s Self Cleaning Sensor Unit make the EOS 400D Australia’s new favourite digital SLR.Sydney, 24 August 2006 – Finding the perfect shot is now easier than ever before, with Canon Australia today announcing the EOS 400D digital SLR (D-SLR) camera. With accelerating interest in digital SLR cameras, Canon developed the EOS 400D to make creative photography both exciting and incredibly accessible to anyone who loves telling a story through photos.Replacing Australia’s number one-selling D-SLR, the EOS 350D, the new model includes a Canon-developed 10.1 megapixel CMOS image sensor that delivers stunning, professional quality photographs. Super-fast image processing, thanks to Canon’s proprietary DiG!C II processor, ensures the camera is capable of capturing three frames per second (fps) for a burst of up to 27 consecutive frames. Scott Jackson, Product Manager, Consumer Imaging Products Group, Canon Australia, said Canon developed the new model to inspire users to discover their creativity – simply by having fun with photography. “Photography allows us to share our view of the world through pictures, and Canon believes digital SLR photography should make it easy for anyone who enjoys taking photos to have fun finding their shot. “With the EOS 400D we’ve made it easier to enjoy creative digital SLR photography,” said Mr Jackson. Exceptional clarity, razor-sharp images and rich colours are all the hallmarks of a Canon-developed 10.1 megapixel CMOS sensor. Combined with the imaging performance and super-fast speed of the DiG!C II image processor, the EOS 400D is the perfect camera for creative photography fun. While it’s an incredibly capable partner for advanced photography, the EOS 400D is also perfect for beginners. With a large 2.5-inch LCD screen, and Mode Dial for selection of modes such as Sports, Portrait and Landscape, the camera optimises the settings for particular situations and conditions – built-in expertise to develop the photographer. Picture Style settings simulate the characteristics of different types of film, providing photographers with control over the ‘look’ of their images. Options include Standard – for punchy, print-from-the-camera colour; Portrait – for softer, more natural skin tones; Landscape – for vivid blues and greens and overall sharpness; and Neutral, Faithful and Monochrome, for a more traditional Black and White look. Up until now dust has presented a challenge to capturing the perfect image. If tiny particles of dust manage to enter the camera and adhere to its image sensor, the Self Cleaning Sensor Unit automatically removes them as soon as the camera is switched on, while software removes stubborn dust spots. Canon EF Lenses are the choice of professional photographers all over the world for their optical brilliance and endless versatility. The EOS 400D is compatible with the full range of over 50 EF lenses, the world’s largest range, from ultra wide-angle to Super Telephoto and everything in between, including Fisheye and Macro lenses. Canon’s latest lens, the EF 50mm f/1.2L USM, is the fastest standard lens in Canon’s line-up The EF 50mm f/1.2L USM uses a large diameter, high precision aspherical element to achieve superb image quality. Its large maximum aperture allows incredibly shallow depth-of-field and a circular aperture diaphragm ensures attractive background defocus. With its ring-type Ultrasonic Motor (USM) the EF 50mm f/1.2L USM delivers virtually silent operation and full-time mechanical manual focusing, along with high levels of dust and moisture resistance. Canon has also announced the EF 70-200mm f/4L IS USM lens, which builds on the L-series telephoto zoom lens heritage and adds an Image Stabilizer (IS). Canon’s Image Stabilizer compensates for the equivalent of approximately four shutter speeds, allowing photographers to capture handheld shots at shutter speeds four stops slower that would otherwise be possible without camera shake blur. Combining a fluorite element with a UD-glass element delivers exceptional performance throughout the zoom range. Its ring-type Ultrasonic Motor (USM) offers fast, virtually silent operation and, like the EF 50mm f/1.2L USM, manual focusing is possible even during AF mode with full-time mechanical focusing. Importantly for travelling photographers, the lens is designed for use in harsh conditions, incorporating high levels of dust and moisture resistance. 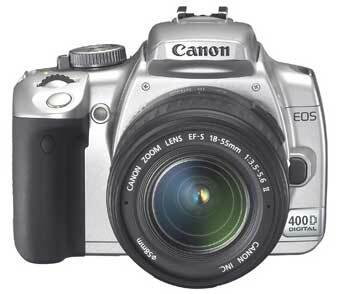 Canon’s EOS 400D supports a range of standard and optional accessories, including the optional BG-E3 Battery Grip. The EOS 400D is also compatible with the complete range of over 50 Canon EF and EF-S lenses, including L-series and Image Stabilizer lenses, and Canon’s EX-series Speedlites. The Canon EOS 400D will be available in both black and silver in various kit configurations from Canon resellers nationally in early September, with pricing to be confirmed. The EF 50mm f/1.2L USM will be available late September and the EF 70-200mm f/4L IS USM late November through Canon resellers nationally. EOS Integrated Cleaning System providing total protection from appearance of sensor dust in images. 23rd Canon China springs a leak? Initial Pre Announcement info – from a leaked page on a Canon China site? Compatible with 60 EF lens and all EF-S lens. 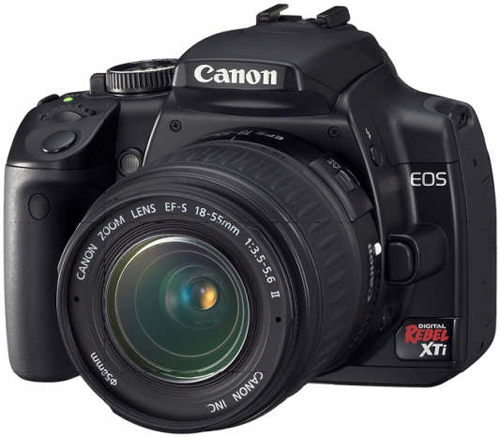 August 24, 2006, Canon (China) Ltd. in Beijing issued a 35-mm single lens reflective camera digital new products EOS 400D . This new product with a number of the latest technologies from Canon, with outstanding picture quality, mature design and perfect functions for induction-level digital cameras Shanfan established higher standards. EOS 400D 10.1 million effective pixels using new CMOS image sensor with integrated dust removal system is the most advanced and equipped with 2.5-inch wide-area automatic offer LCD,9 point autofocus system, rich photographs style Airframe delicate portable.”This is the long-awaited market products to be 10 million pixels and improve the removal system level marked EOS 400D Entry level digital cameras Danfan will lead into a new era. “Canon (China) Co., Ltd. Department senior general manager of consumer products images information Jigangda sang said,” Canon is a long history of camera manufacturers, but also digital video industry leaders, sets in the areas top technology advantages, EOS 400D Performance closer to the professional level digital cameras Shanfan also have higher Xingjiebi. 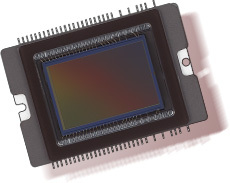 “The boundary pixels CMOS image sensor and high-performance digital video processor. Image sensor and digital image processor two core technologies, determine digital cameras in picture quality Danfan the performance. Canon independent development and manufacture of CMOS image sensors with Xinzaobi high, wide dynamic range, low transmission speed and consumption advantages EOS 400D Use APS-C size (22.2 x 14.8 mm) CMOS image sensor, lens focal length conversion factor is 1.6 times, which reached 10.1 million effective pixels, maximum resolution photographs to 3888 x 2592 pixels, ISO sensibility scope of the installation by 100 to 1,600. ensure that the lighting in various conditions can be used EOS 400D The picture quality was excellent. Canon independent development of the second generation of high-performance digital image processor DIGIC II, the unique structure and processing algorithms for high picture quality and high-speed image processing at the same time achieve its high-resolution CMOS image sensors with the combination of photographs with rich details and a realistic sense of the true colors restored. Dan Fan for digital camera lens can be an important advantage for shooting different subjects photographs facilitated. However, the replacement lens in the process, outside dust very easily into Airframe house, once dust in the image sensor, attached to the photographs, may be visible, resulting in lower picture quality. EOS 400D Canon introduced the EOS develop new integrated dust removal system, which is a curb dust including the generation, accumulation and removal of a comprehensive and effective measures for sensor dust, EOS 400D Danfan also become digital cameras, Canon EOS 1, with the dust functional models. 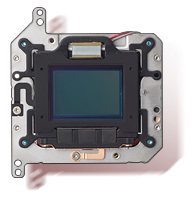 EOS 400D Airframe internal (such as the shutter unit and serial Gai, etc.) used to contain dust crumbs from agencies and materials, and conducted Kangjingdian processing, which can greatly reduce dust particles all the time and the adsorption process. For the removal of dust, EOS integrated dust removal system following three measures : Since cleaning sensors modules (Self Cleaning Sensor Unit), removal functions (Dust Delete function) and manual cleaning sensors. EOS 400D There are three levels of CMOS optical sensors former low-tide, low-tide sensors and sealed together, dust only chemical components in the sensor most of the first outer layer optical low-tide, without entering internal components. In the first top-tier low-camera installed piezoelectric elements, piezoelectric components produced by ultrasound vibration to the first tier in the low-tide accelerated vibration, thereby causing chemical in his dust, the dust will adhere ended in the first tier of 25-40 low-bottom filter material. 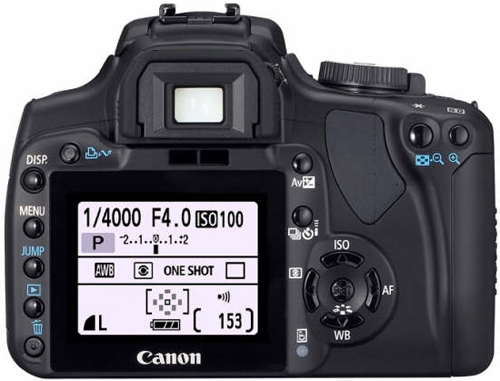 In EOS 400D The acquiescence of, cameras, sensors switch on the machine and communications modules can be activated automatically since cleaning; Switch on the machine may also be required under state through the establishment of manual activation of the menu functions. Clean sensors modules since about 1 seconds each time, it can effectively remove most of the dust through. Canon EOS cameras filmed priority is always the design ideas, since the sensors clean modules work, half will be interrupted by the camera shutter button and immediately return to shooting clean state to ensure that photographers not to miss the decisive moment. For some special minor or special Nien stubborn dust, sensors modules may be difficult to effectively clean since removed. To deal with this situation, EOS 400D The removal functions will be very effective, through this function, one can check out the material in the low-level image size and location of the dust removal data, and their subsequent removal of data added to the image data, pictures, then Digital Photo Professional 2.2 software through random to the removal of image data effectively reduce dust impact or dust effects reduced to less than aware of the extent. Through the camera menu “clean sensors” functional and lock up reflective panels, opened the shutter curtains, gas blowing softly blew onto the dust in the sensor components. The comprehensive professional functions and further enhance performance. EOS 400D Introduced with the same high-precision 9:00 EOS 30D automatically wide area autofocus system, compared with the previous generation of products, automatic light autofocus function in a weaker environment. 35 meter zone evaluation system provides evaluation meter, and the central focus of local orbital average orbital three ways. Use the 2.5-inch 230,000 pixels offer LCD, a menu and browse photographs more clearly, convenient, the screen brightness can be adjusted in the context of 7 level, the highest brightness than the EOS 30D and EOS 5D raise about 40%. LCD above the closing show additional sensors, sensors to detect eye to people close to the optical span devices to film, with the closure of an LCD showing avoid bright LCD cause eye irritation. EOS 400 with “style photographs (Picture Style)” function. Choose different photos style, as the film features different options to meet different shooting intention, in addition to the pre-set standards, portrait, landscape, neutral, reliable and monochromatic set up six, three more since the definition photographs style. Each style can to Ruiduo, contrast, saturation, and other parameters for fine-tuning, unlimited meet photographic creativity. EOS 400D 11 Since the definition of functions, user-friendly habits on the basis of their own creation. Which prolonged exposure Jiangzao functions could be designed as “automatic” camera automatically detect exposure time to reach or exceed 1 seconds photographs, Jiangzao. Speed performance digital cameras Danfan important indicators, EOS 400D The activation speed is 0.2 seconds, Lianpai rate reached 3 Zhang / s, a maximum of 27 shooting Zhang Zhang JPEG or 10 raw photos. Shutter speed range is 1/4000-30 seconds, the maximum flash synchronization speed of 1/200 seconds. The good compatibility of the EOS system. EOS 400D Overall balance of the 60 compatible Canon; EF lens series, including Canon specifically for use APS-C size CMOS image sensor digital camera designed Shanfan EF-S programs such huge lens group for shooting various topics users a comprehensive solution. EOS 400D Ex series Speedlite flash support, to ensure the E-TTL II environment can be optimized in various flash exposure. Battery boxes and handle BG-E3 facilitate vertical shoot to install 2 NB-2LH lithium batteries, can be installed 6 5th batteries. EOS 400D A USB 2.0 high-speed transmission interface, through the cameras embedded PTP transmission agreement, cameras and computers can directly connect photo transmission, or with the support of PictBridge cameras will be connected to the printer and print photos directly. 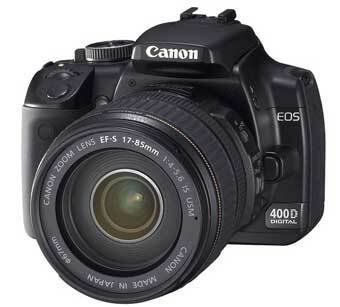 EOS 400D Random with the latest version of Canon digital cameras Shanfan solution EOS digital solution disk Ver. 13, including specifically for digital camera applications development Danfan the EOS 195,000 1.1 (Windows/Macintosh) strong professional image processing software Digital Photo Professional 2.2 (Windows/Macintosh) check images and editing software ZoomBrowser ex 5.7 (Windows) /ImageBrowser 5.7 (Macintosh), the raw image processing software raw Image Task 2.4 (Windows/Macintosh); PhotoStitch 3.1 software image combinations (Windows/Macintosh). The family of two; EF lens star. “L” is the first letter of the English words luxury in the EOS series Shanfan cameras use; EF series lens, red “L” as a symbol of the highest optical quality of Canon. And EOS 400D There are also issued two; EF lens new products, which are new members of the L lens, with a distinct personality and outstanding image quality. The new lens; EF 70-200mm f/4L is USM. Canon launched in 1999 Yuanshe photography; EF 70-200mm f/4L USM sets excellent optical quality and lightweight portable characteristics favored by many users. With the popularity of digital cameras Danfan, users will browse or photographs enlarged print, more convenient than ever, cameras and camera instability caused problems more easily blurred images shown. In such cases, an increase of is (Image Stabilizer) optical image stabilizer new products; EF 70-200mm f/4L is USM will help users shooting clearer picture. ; EF is USM 70-200mm f/4L optical lenses structure is 15 Group 20, which includes one of fluorite lenses and two pieces of ultra-dispersive (jump) lenses. It is 1.2 metres recently stabbed distance, using circular ultrasonic motor-driven automatic autofocus lens, quiet and speedy and has a full-time manual autofocus function. Canon is optical image stabilizer available to the largest number of four stalls shutter speed Fangdoudong results. Better results raise dust and waterproof sealed Ti performance. Scene optical components are used environmental unleaded glass materials. The new lens; EF 50mm f/1.2L USM. There will be a large-calibre professional focus has always been; EF lens series of the most watched products to their excellent image quality and strong performance of a large number of amateur photographers dream. Canon first use of high index of refraction glass manufacturing large-calibre high-precision non-spherical lenses have excellent resolution and contrast, the big winner of the second focus of imaging to become a USM; EF 50mm f/1.2L f/1.2L II USM EF85 mm section after another shooting portrait photographs weapon. ; EF 50mm USM f/1.2L optical lenses structure is six groups of eight, including one of the non-spherical lenses. Recently stabbed distance of 0.45 metres, eight films circular aperture can be very soft, the focus imaging. In conjunction with the use of digital cameras, Chan Fan, super spectral coating technology effectively curbed images and flicker phenomenon. 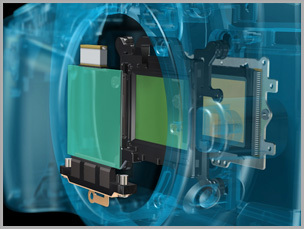 Circular ultrasonic motor-driven automatic autofocus lens, and a full-time manual autofocus function. New sealed more effective dust and waterproof drip effect. Scene optical components are used environmental unleaded glass materials.